Evaporated Milk’s Connecticut Connection – Who Knew? November 23, 2016 • Business and Industry, Civil War, Civil War and Reconstruction, Food and Drink, Torrington, Who Knew? …that in 1856 businessman Gail Borden Jr. opened the first commercial milk condensery at Wolcottville (now Torrington). 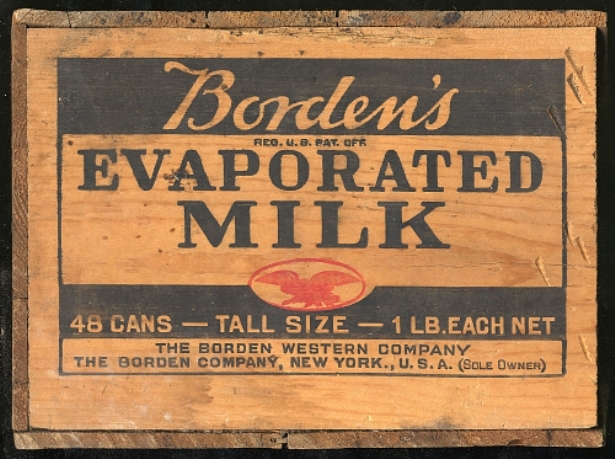 Borden had applied for a patent for the concentration and preservation of milk in 1853 but was denied by the patent office for the “lack-of-novelty” and usefulness. He eventually won the dispute by proving that his process of canning milk by concentrating it in a partial vacuum (out of contact with the air) and not needing to add sugar to preserve it was actually a new and improved method. The idea for using a vacuum evaporator to kill bacteria in fresh milk had been inspired by the Shakers’ technology for preserving fruit. In 1856, after three years of defending the value of his process to patent officials, Borden received the patent for “Improvement in Concentration of Milk”. The expense of the patent filing process forced Borden to seek out financial partners to begin production. He gave Thomas Green 3/8 of his patent rights and provided James Bridge 1/4 interest on his investment and together the men built the first condensery in Wolcottville. The factory was not immediately successful and halted production in less than a year. Borden was so confident in his product that he built a new factory in Burrville (also now Torrington), which opened in 1857; this also failed. Undeterred, Borden found another investor in Jeremiah Milbank of New York. The two became partners and founded the New York Condensed Milk Company. The company’s first major orders came from the US Government which used condensed milk to feed the troops during the Civil War. The company changed its name to the Borden Condensed Milk Company in 1899 and then to the Borden Company in 1919. Mounds Candy Bar Involved in Espionage – Who Knew?